First, the card and then the talk! Thanks so much for the comments on my last post, where I expressed frustration with my stamping. Read them, pondered, and eventually settled on a new-for-now approach. I'm calling is ReDesign on a Dime (sounds like a HGTV show, doesn't it?). It marries my limited design skills and budget with my desire to stamp. I take something another stamper has made and make it with my own supplies. 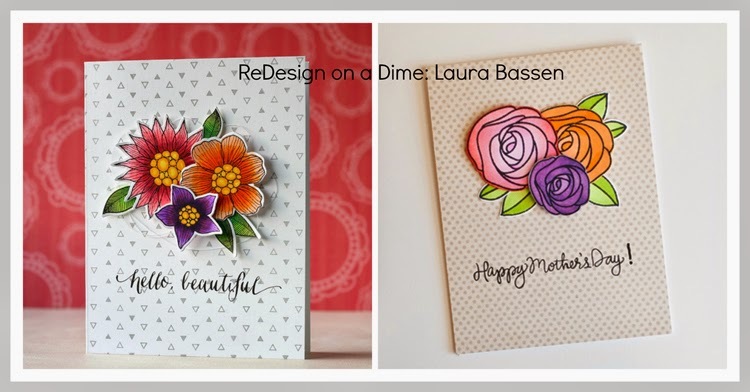 Today I took this card made by the so fun and talented superstar Laura Bassen. It is intimidating to put her card next to mine, but Laura graciously agreed so here goes! Isn't Laura's card gorgeous? Loved the colors and the gray triangles on the background. If you look closely, you'll see that Laura wrapped some white twine under the popped up flowers. 1. I have one floral outline set with single flowers big enough for this design. (How did that happen??) Colored the flowers with Copics, hand cut, and edged with Ranger Distress inks. 2. Since I did not have a background like Laura's and don't have pale gray ink, I substituted some patterned paper. 3. I did not wrap any twine under my flowers because I would have made a hot mess. 4. Added the exclamation point by hand because the sentiment was not centered. Looks better in person! Thanks to Laura for her talent! Laura's card is better and here's why -- the green leaves are darker and provide more contrast. She clustered her flowers closer together, which works to form a better focal point. Plus, her flowers have same colored centers to pull them together. And, the gray and white background is lighter and trendy. But, I didn't spend any money buying new things to make this card and it was much easier to have Laura's card as a model and I learned a few things. A win! MOOD WHEN DONE = Intimidated but Happy! Stamps: Simon Says Stamp Best Mom Ever! Your card is JUST AS beautiful! Your card is gorgeous! I love your new Redesign idea! Great card and great idea as well -- more please! What did they call that HGTV show where designers came in and rearranged a home without buying new stuff? Your Redesign idea is like that but better since I have more stamps and paper than furniture!!! Love your beautiful card! Your Copic coloring is gorgeous! Don't be so hard on yourself....you're starting to sound like me:) I'm just glad you were inspired and found stuff you already had on hand to work with. Hugs! I love your card Joan! This is a great re-design of Laura's card. Such a good idea to help jump start creativity and use what you have on hand. Well, at the very least, I like your BG a lot better. It goes with the flowers. Yes, possibly the flowers could be closer, but I think that it is a matter of style. It's a great re-design and saving $$, and possibly storage space, is important. Have a great weekend. Hey, Joan, I'm a huge Laura B. fan too, and you did a great job! I have often been tempted to write a blog series on how to use what you have instead of feeling like you have to place "one more order" before you can make anything, but my husband thinks that it probably wouldn't be great for my job longevity. . . ;-D Kudos to you! LOL Debbie. Good point. Your job is to sell. Mine is to avoid bankruptcy! So, SO pretty.... and, hey, I have that stamp too! 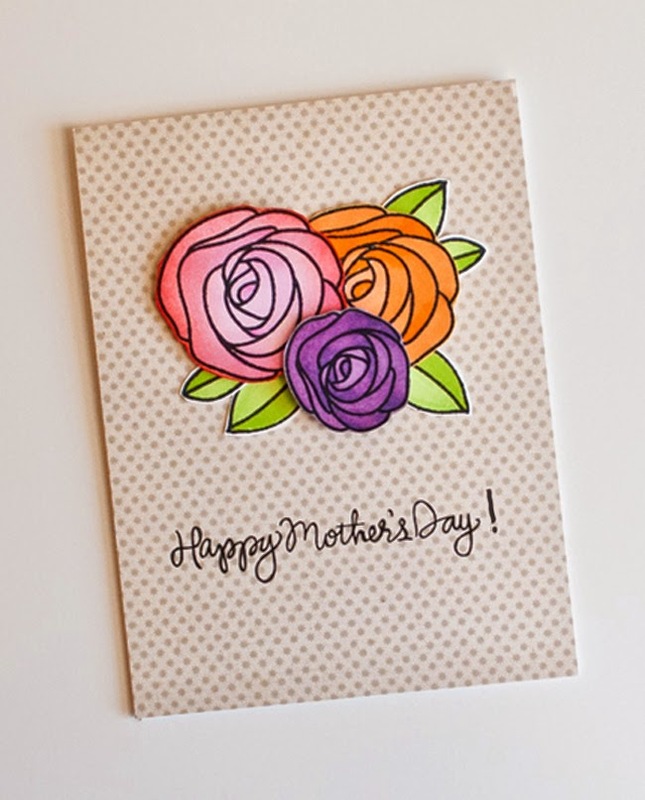 Off I go to make a Mother's Day card. Thanks for the inspiration! I am grateful for what you are doing and how you are sharing, Joan. While I think that I would love to be able to buy whatever I want to - I can tell you that from doing that for a year or so I can see my creativity suffering and other parts of my life because I am drowning in *stuff* now. You are a wise woman and a beautiful artist. I appreciate you. Great idea. I love Laura's work very much. Your card turned out so beautifully. I rarely make anything that's originally mine but rather rely on skilled stamper's samples for inspiration. What a clever and catchy name for what you did. I love your card, and think that you are being much too hard on yourself. It is beautiful. They are both beautiful, Joan! Different flowers and paper, but very similar -- I see no negatives on your card -- only beauty. Too many supplies and stamps can be overwhelming and actually impede creativity. I like your "redesign on a dime" idea! I think they're both equally lovely! Cool idea, Joan! I love Laura B. Looking forwarding to seeignwhat else you have in store. I chose Laura last year for Clear and Simple Stamps' Spread the Love campign, so I totally know how intimidating it is to post a card next to one of hers. I also see what you mean about the specific elements of her card that worked really well, but yours turned out really nice, and the recipient will just be looking at that, not making a comparison!